I’d had a conversation, reminiscing with a cousin on the other side of the family, about fruitcake cookies. And so this morning, I rummaged around in a cabinet until I found my mother-in-law’s old recipe box. I sat down with my cup of tea and pulled up the lid. And I was instantly transported back to her house. The contents smelled just like Momma Nell’s home. But not like what you’re thinking. It wasn’t the scent of years-ago grease from all that Southern fried chicken and steak. Instead, it was slightly musty, sort of like when you open an old book. Momma Nell had lived in the same house for over fifty years and though it was immaculately clean, it was also like a museum. Sort of a “Life in the 1950s” kind of exhibition. And that smell—dry, musty, with just a hint of Pledge—assaulted my senses and all kinds of memories flooded back. How powerful our senses are! And yet, how often we leave them out in our writing. Or maybe that’s just me. Anyway, the point is this: if you want to make your writing stronger, add sensory details. It’s easy when we’re writing about sensory-rich subjects. Even I, notorious for bare bones writing, can come up with some pretty good and smelly details if I’m writing about Christmas. But put my character in some average spot, like an apartment, on an ordinary day in June, and I’ve got nothing. I think writing with sensory details must take practice, and I admit that it’s not high on my practice list. But it should be, and I realized that little nugget of writing wisdom the minute I had a whiff of that recipe box. That smell connected me to a hundred different feelings and images, in just a fraction of a second. Imagine how many words I’d need to make that same connection if I were describing how my mother-in-law's house looks! I’m going to put that recipe box on my desk so I’ll remember this lesson. But I have another motive as well. I didn’t find the index card for her fruitcake cookies, but I did find a couple of other recipes that looked interesting. Some were typed, but others were carefully written, and I thought how glad I was that she’d put them down, in her hand. There was something very comforting about reading those words in her handwriting. I suppose that, again, it was a sensory detail and I sighed, remembering Momma Nell in the kitchen. I remembered, too, that one year, I’d written down my favorite family recipes—it didn’t take long; I’m not much of a cook—and gave the book to my daughter for Christmas. But I never quite got around to doing the same for my two boys. I hope this is the year that I’ll get that gift completed. So that someday, my children will read a recipe in my chicken scratch handwriting and maybe a hundred different memories will come flooding back to them, too. Well, okay, maybe two or three memories. It’s the thought that counts, right? I love this! Every time we print a recipe off of the internet, I feel we're losing a little something by not writing it out by hand and storing it in a box. There's something really neat about having butter stains and flour smudges on my recipes! 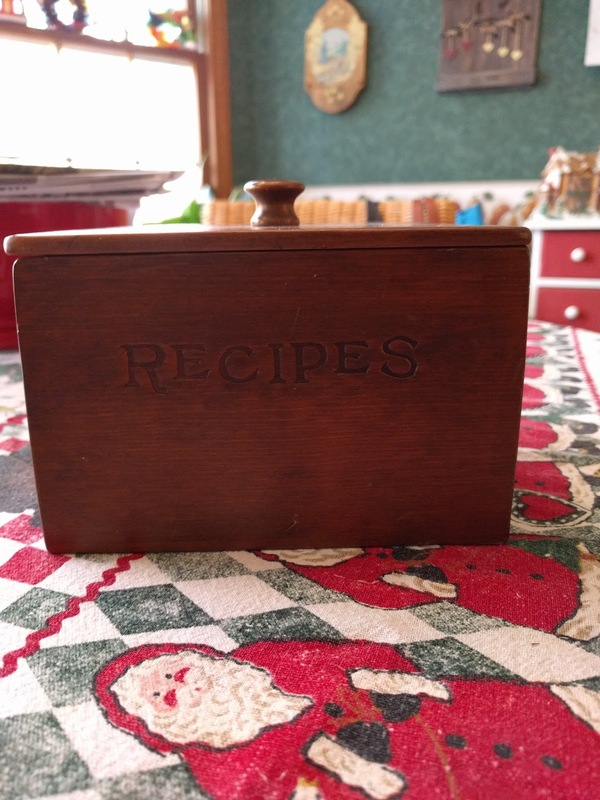 What an amazing thing that you have this recipe/memory box from your mother-in-law. Good advice to take those small, yet important details and incorporate those into our stories. We've sanitized, mechanized, and abbreviated everything we do. Your post reminds me of how much this allows our descendants to miss. Great post, Cathy. Sometimes those senses elude me and I struggle to find them. I'm going to remember Momma Nell's recipe box. I have handwritten recipes written by my Mom which triggered moments in the kitchen with her and my grandmother. Thank you for helping me down memory lane. Cathy--What a gift that will be for your sons. Cathy, This sweet post made me smile. I understand the visceral reaction when looking at a lost loved one's handwriting. I had a couple papers where my dad listed out all the spices I had. He's been gone almost 20 years now, but looking at that list, touching that list brings up memories of dad and gives me such joy. This is wonderful. Cogent advice for us writers, and so evocative of wonderful memories. I can just about smell that musty-with-just-a-hint-of-Pledge smell in my mind's nose as I read. And for some reason, I'm remembering my cousin Pat's molasses cookies -- the fragrance and the taste. Thank you for that! What a wonderful idea to use a recipe box as a reminder to include our senses in our writing. As I read your post, I was there with you in your mother-in-law's house, especially when you included the detail of Pledge furniture polish. I could smell the lemony scent. Thanks for this reminder of how important sensual detail is to writing! Oh, I'm so glad y'all shared your memories with me! I'm glad you found something to add to your writing, and I'm especially glad for every comment you leave. That range of emotions released when you opened the recipe box, is exactly what happens to me when I remember my grandma's basement...a good kind of dank from hot sudsy wash water. Great post, Cathy.